Intra-protein proton transfer is perhaps the most fundamental flux in the biosphere. It is essential for such important processes as photosynthesis, respiration and ATP synthesis. Within a protein, protons appear only in covalently bound states. Here proton transfer is essentially the motion along a hydrogen bond, for instance peptide or DNA H-bonds or the more complicated pathways in proton-pumping proteins. The energy barrier for this reaction depends strongly on the conformation of the reaction complex, concerning as well its geometry as its protonation state. Due to the small mass of the proton the description of the proton transfer process has to be discussed on the basis of quantum mechanics. 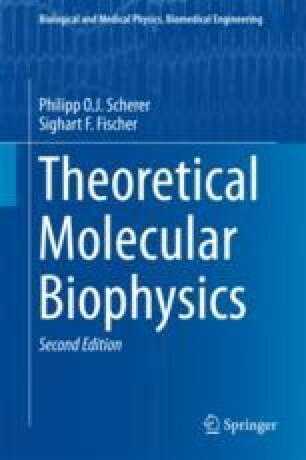 This chapter begins with a discussion of the photocycle of the proton pump bacteriorhodopsin. We introduce the double Born-Oppenheimer separation for the different time scales of electrons, protons and the heavier nuclei and discuss nonadiabatic proton transfer in analogy to Marcus’ electron transfer theory. We present the model by Borgis and Hynes which includes non-Condon effects. Finally, we comment on adiabatic proton transfer.